Kids@ Church is an all-Australian, Bible-based resource that systematically teaches children about God's saving purposes in his Son, Jesus. The basic component of the curriculum is a 90-page spiral bound Teacher's Guide, which presents 10 Bible-focused lessons, each with detailed instructions for lots of age-appropriate learning activities. Included is a series of colourful posters and charts that integrate with the lessons. The Teacher's Guide is meant to be used in tandem with a separately sold Child's Component kit, which contains lesson-related activity workbooks for 5 children. Purchase as many of these as are required for your class size. Each Teacher's Guide (plus Child's Component) covers one of 12 units, which together are designed to run over 3 years, i.e. 4 units per year. These 12 units are available in 3 age levels: 3-5 for non-readers; 5-7 for beginning readers; and 8-11 for independent readers. 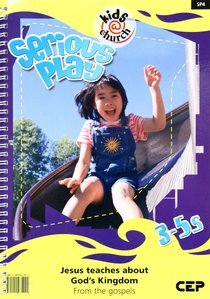 About "Kids@Church 04: Sp4 Ages 3-5 Teacher's Pack (Serious Play) (Kids@church Curriculum Series)"
Unavailable. This item is Out of Print. The publisher is considering whether to reprint. We will hold your order and notify you if they decide not to reprint. 0 Available.